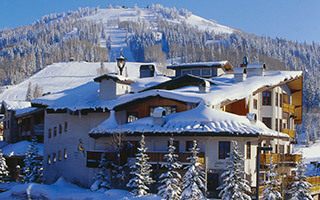 Located high on the slopes above Park City and just steps from the ski runs of Deer Valley Resort, the Goldener Hirsch Inn is home to a European environment in an unparalleled natural setting, featuring award-winning ski-in/ski-out luxury accommodations, personal five star service, and the renowned Goldener Hirsch Restaurant and lounge. The hotel’s 20 rooms feature European king-sized beds, hand-painted furnishings, fluffy terry cloth robes and slippers, private balconies and wood burning fireplaces. Guests can also enjoy the hotel’s hot tubs, sauna and exercise equipment and the Continental and American fare from its on-site restaurant, which has earned “Extraordinary” ratings from Zagat Restaurant Guide, Four-Diamond recommendations from AAA, and was awarded the “Best of State” for Fine Dining — European Cuisine in 2017 by the Best of State® organization. Our luxury boutique hotel provides a perfect setting for intimate meetings, weddings and special occasions. Goldener Hirsch Residences Deer Valley® is very excited about the opportunity to manage the expansion of the Goldener Hirsch Inn to include the new Residences located on the property adjacent to the Inn. This exciting development will include 40 luxury residential condominiums featuring studio to three-bedroom floor plans, with many offering a lock-off configuration. Other amenities will include a conference center, roof top patio with pool and hot tub and incredible views; a ski valet; an après-ski lounge; bridge plaza connection from the expansion to the existing Goldener Hirsch Inn; and two levels of underground parking complete with storage areas for the residence owners. To learn more, click here. Each luxury Signature Hotel Room features cozy king beds, sitting areas, flat screen HDTVs, refrigerators, personal Keurig coffee makers and in-room safe. Please note: Each room has a different and unique floor plan, with its own distinct personality. Some room features may vary by room. To view actual prices, enter dates to check availability. Relax in elegant European style in our well-appointed Suites including king beds, fireplaces, a private balcony, sitting area, flat screen HDTV, refrigerator, personal Keurig coffee maker and in-room safe. Please note: Each room has a different and unique floor plan, with its own distinct personality. Some room features may vary by room. Enjoy ultimate luxury in our Deluxe Suite featuring, a king bed, jetted tub, sofa sleeper, double vanity, fireplace, private balcony, additional room with sitting area, flat screen HDTV, refrigerator, personal Keurig coffee maker and in-room safe. Please note: Each room has a different and unique floor plan, with its own distinct personality. Some room features may vary by room. **Winter season amenities are available during ski season dates only. Summer (April 8, 2019 – December 6, 2019): A one night deposit is due 24 hours from booking. Full payment, including taxes and fees, is due seven days prior to arrival. If reservation is made less than seven days from arrival, full payment is due 24 hours from time of booking. Summer (April 8, 2019 – December 6, 2019): Once paid, all deposits are non-refundable.